(Nanowerk Spotlight) One of the persistent challenges associated with electrode degradation and battery failure is the stress induced by ion intercalation, companied by large volume fluctuation of electrode materials. A typical battery electrode is composed of a mixture of active material, conductive agent, and binder. In the charge/discharge process, the stress builds up on each active material particle, while the binder and conductive agent partially accommodate the stress up to a certain extent. 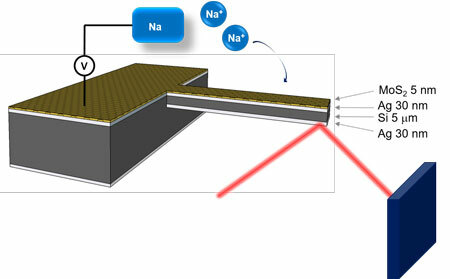 The macroscopic stress on the electrode is the overall effect of the stress generation and adsorption in the electrode matrix, but it does not reflect the localized intrinsic stress on the active material particles. To explore these issues, researchers have developed numerous in situ microscopy and spectrometry technologies that provided valuable insights into the impacts of the stress buildup and release – e.g. the stress-induced structural changes. Nevertheless, the strength of the localized stress at the micro- and nanoscale remains poorly understood, which is a knowledge gap in improving the cycle life of rechargeable batteries. In new work, reported in Science Advances ("Anomalous interfacial stress generation during sodium intercalation/extraction in MoS2 thin-film anodes"), researchers have developed an in situ solution to quantitatively measure the localized stress on electrodes. To do that, they used microcantilever sensors, suspended beams with extremely high sensitivity to stress variations. These findings could help to improve the cycle life of rechargeable batteries. "Localized is the key word of our work," Zhi Li, an adjunct professor at University of Alberta and the paper's first co-author together with Keren Jiang, tells Nanowerk. "The macroscopic stress on bulk electrode/cell is the overall effect of the stress generation and adsorption in the electrode matrix, but it does not reflect the localized intrinsic stress on the active material particles." "The localized stress is likely of more importance in understanding the electrode degradation because the localized degradation of the active material particles (e.g., cracking and pulverization) leads to battery failures," Li continues. "At bulk electrode/cell level, there may not be any noticeable difference between a functional and a failed cell. To develop a long-life electrode, it is essential to understand how the stress builds up at the micro- and nanoscale, e.g., in a nanofilm or in a single particle with different morphology, and under various charge/discharge conditions." The team points out that their approach can be adapted to help resolve the localized stress in a wide range of electrode materials; to gain additional insights into mechanical effects of charge storage; and for long-lifetime battery design. "The protocol developed in our work can be readily adapted to resolve the localized stress in a wide range of micro- and nanoscale electrode materials and provide additional insights for electrode design and optimization," notes Li. Li recounts the time when he introduced his research in energy storage to the paper's senior author, Dr. Thundat, one of the pioneer researchers in nanomechanics and Canada Excellence Research Chair Laureate, he pointed out that the nanomechanics in batteries needs to be understood. "That recalled my memory at Sandia National Lab, where I witnessed the stress-induced electrode pulverization using in an in situ TEM," he says. "However, we had no clue about the exact value of the stress. I suddenly realized that the nanomechanics may lead to the right answer." 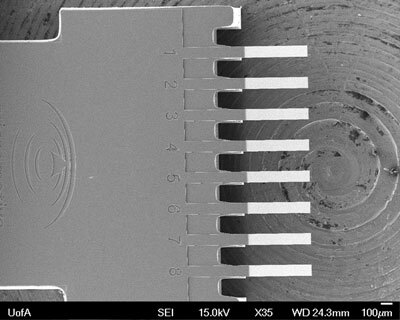 And now, by using microcantilever, Li and his collaborators succeeded in quantitatively resolving the localized stress in electrodes for the first time. However, this is just a first step. In the next step, the researchers will investigate other localized physical and chemical property changes in electrodes, such as heat generation and Young?s modulus changes. "To improve the cycle life of rechargeable batteries, we will need a comprehensive understanding of the localized chem-electro-mechanical properties of electrodes and their correlations," Li concludes. "The challenges come from how to design a platform to monitor all the dynamic changes simultaneously."